For Immediate Release – Fortis Manufacturing is pleased to announce our new lower receiver – utilizing the aesthetics and features found commonly in our accessories – embodies all that is Fortis. At Fortis, our aim is to provide “Operator” needed strength with exceptional design and aesthetics at an affordable price. Fortis Manufacturing, Inc. (FMI), utilizes only the highest quality materials available and machining that is second to none. We intentionally waited to release our lower receiver. When the masses were releasing products that all looked similar, we were busy designing, testing, evaluating and then repeating the process until we got it just right. Truth, liberty, & justice for all isn’t just our Pledge of Allegiance, but it’s our LICENSE and civic duty to uphold all that’s great about our country. The freedom to do so and the license of liberty. 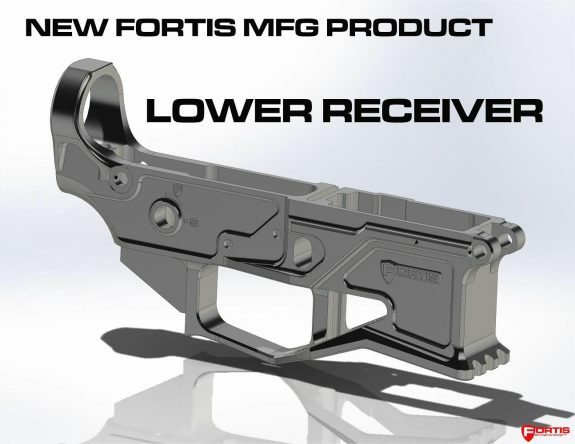 Introducing the Fortis License™ Lower Receiver. Made from 7075 T6 billet aluminum. We offer the things that you need and eliminated the fluff that you don’t. The License™ is the base and foundation for any great build so give us a try, we guarantee you won’t be disappointed. **Photos are just renditions as we’ve already made some changes to the design. Will release March/April 2018, but will be offering an introductory price for the first batch. Click on the button to be notified. 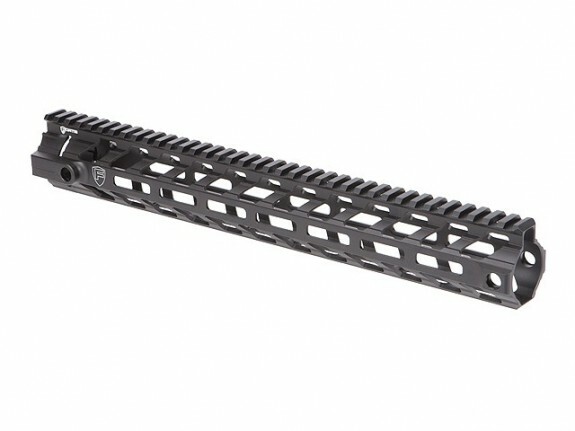 The Fortis REV II rails will now be available in an M-LOK version. The 14″ version is being released first exclusively on Revolvr. I used a REV II (KeyMod) to save weight on my recent Sub 6 with a Twist build. It was the perfect choice due its lightweight and the fact that it mounts to the standard barrel nut. I purchased a 12″ Fortis REV Free Float Rail for use on my lightweight project build and it has served me well. I needed an extremely lightweight, extended rail that mounted on the standard barrel nut for a 14.5″ barrel with permanently attached muzzle device and the REV fit hte bill perfectly. 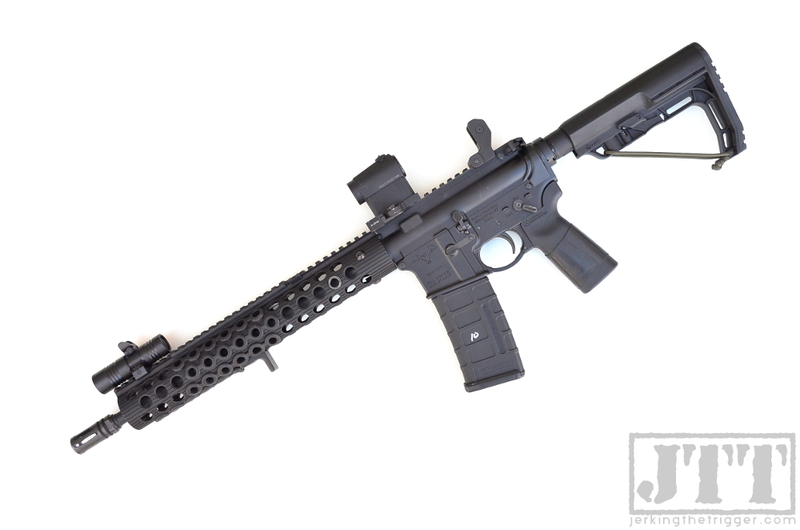 Fortis has now released the REV II that is basically the same rail except the short the 3, 6 & 9 o’clock forward rails that are present on the REV have been removed on the REV II. They have been replaced with additional KeyMod real estate and QD sling swivel sockets. The result is a rail that weighs even less at just 7.8 ounces (the REV 12 weighs in at 9.2 ounces). This looks like an excellent revision to the REV series of rails. I really don’t use the forward rails and actually find them to be a bit uncomfortable for how I hold the carbine due to some sharp edges. The new version removes the rails, saves weight, and costs less (at the introductory price). That is a win-win-win. The REV II is available at a special introductory price, exclusively on REVOLVR. I am generally of the opinion that a lighter carbine is a better carbine as long as reliability is not sacrificed. I often write about how a little bit of planning and careful selection of the various components that make up your carbine can shed quite a bit of weight. Enough of you have written to ask for advice to shed weight from your carbines that the idea of writing an article about the best ways to save weight finally penetrated my skull. This carbine weighs just over 6.5# and could lose additional weight just by removing some “luxury” items. If you read here often, you have heard me say of many small parts that I have reviewed that they may seem like too small a weight reduction to worry about on their own but as part of an overall weight reduction strategy they make sense. Well, this is the overall strategy that I am talking about. 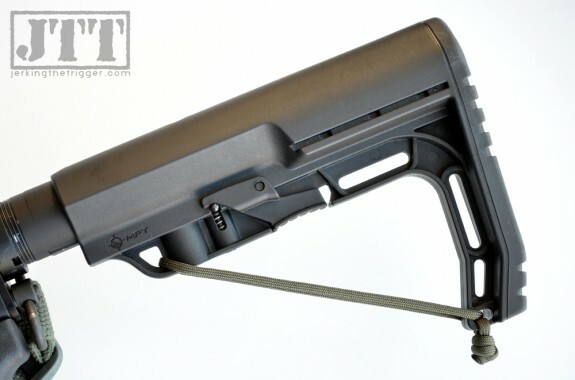 This article will attempt to explore the best places to shed weight form a carbine. In this case, “best” means shedding weight without sacrificing reliability and maintaining an acceptable level of durability. There will be tips and resources for those who already have a carbine that they want to put on a weight loss plan and for those who are building from the ground up (or willing to do a tear down of their existing carbine). A lightweight carbine starts with a plan. You will need to research the various components that you are considering to determine their weight and how they fit into your budget. Choose the lightest parts that meet your requirements for durability and fit in your budget. That sounds simple but it can be an involved process. While you are planning, consider which parts are off limits for weight loss. This may vary based on your requirements. For instance, since I will not compromise on reliability, I do not alter parts from the gas and recoil systems. That means that I use a steel gas block, a proper bolt, an M16 bolt carrier, and the heaviest buffer that will allow my carbine to function with the ammo that I commonly use. I do not play games with any of those components. I also strongly prefer an ambi-selecter so I am more than willing to accept the small weight gain that comes with the Battle Arms Development selectors. Spend some time considering whether or not you actually need each item in your plan. Installing a light weight version of something you don’t need is not the best way to save weight. The best way is to never install it in the first place. Unfortunately, not all manufacturers list weights for their products. If you don’t see a weight listed on the sight try searching to see if anyone has listed a weight on a forum. You can also contact the manufacturer or retailer to see if they will provide the weight specs. Gunstruction can help you plan your build and determine it’s weight before you ever buy a single part! Tactical Yellow Visor created a chart of hand guard weights. It is not complete but it is very useful. 03 Design Group has a page that provides the comparative weights of several upper receivers with varying barrel lengths and profiles. Vuurwapen Blog has a weight calculator that can be useful. Maryland AR Shooters Group has the weights of several individual components listed in a spreadsheet including various barrel profiles. All of these resources can be used to give you a pretty good approximation of the weight differences between various components. The following carbine lightening methods are best suited to those who are building a new carbine from the ground up or those who are willing to tear down and replace major components of their current carbine. Most of what is listed in this section will usually require that a pre-built carbine be re-zeroed after the modification is complete so figure that into your budget. 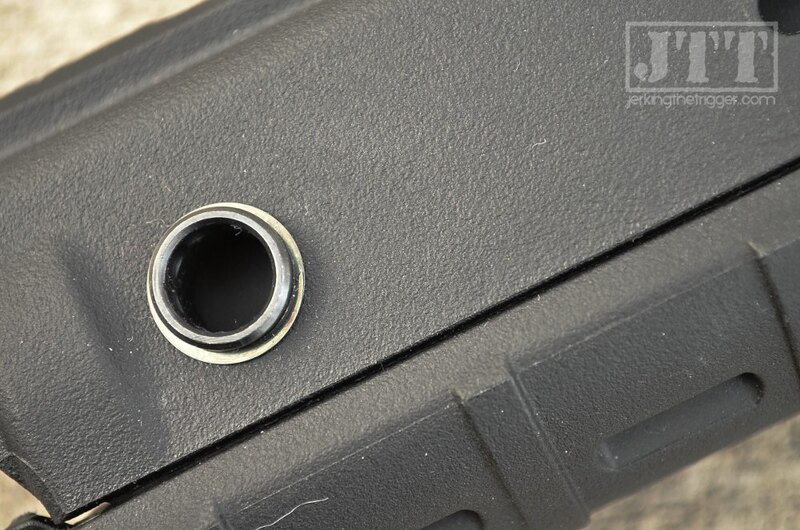 The most efficient place to shed carbine weight is at the barrel. There are three main ways to lose weight at the barrel: shortening, lightening the profile, and fluting. You can save weight but going with a shorter barrel. A 14.5” barrel will weigh less than a 16” barrel of the same profile and gas system. You can save weight by going to a lighter barrel profile. Lightweight barrel profiles are not the accuracy robbing boogieman that they have been made out to be. In fact, in my experience they tend to shoot better than a typical government profile barrel. However, they can and do lose accuracy as they heat up but this is the case with any barrel profile. Generally, unless I am building a true precision carbine, I go with a lightweight barrel profile. Finally, there are several shops that will flute your barrel. You are no longer limited to the standard straight fluting with options like spiral fluting, golf ball-like dimples, honeycomb, and more patterns available. Keep in mind that while these will remove weight, fluting will not remove as much weight as just turning the barrel down to a lighter profile. Combining elements for the three methods of barrel lightening will yield the best results. A 14.5”, lightweight profile with a permanently attached muzzle device will be the lightest barrel option you can easily attain without NFA paper work. There have never been more options for those who want lightweight hand guards. There are many good choices and you will basically only be limited by your budget. It is tempting to think that plastic hand guards are the lightest option but that simply isn’t true. There are a number of free float rails available that are lighter than plastic hand guards. In fact, you can often go as long as 10-13” on your rail and still be lighter than a set of plastic hand guards. Also keep in mind that there are down-stream weight and budget considerations when choosing a hand guard. For instance, Troy’s Alpha Rails are among the lightest on the market but not the lightest. 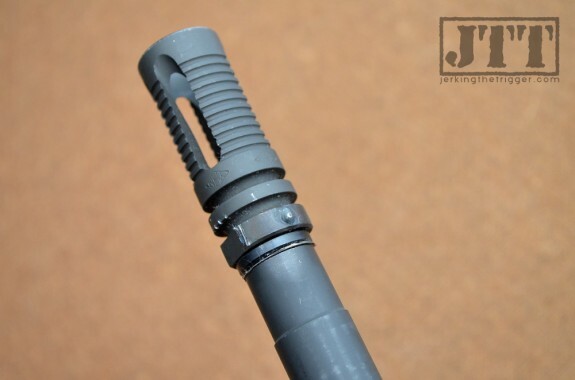 However, they can make use of Impact Weapons Components QD Micro Sling Mount and Weapon Control hand stop (use code “triggerjerk” to save 5% at IWC) which are direct connect components that are the lightest of their type. They are also some of the least expensive. This brings the functional weight of the Troy Alpha closer to lighter rails and makes it one of the most affordable lightweight options. 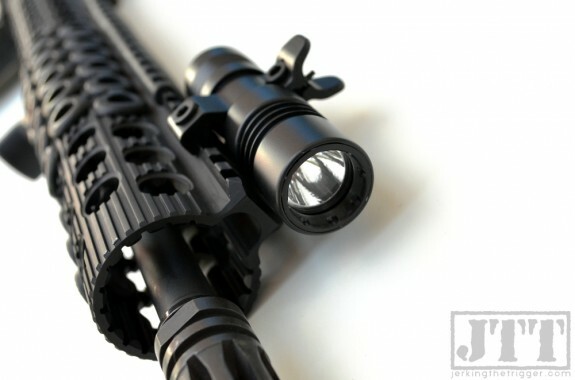 KeyMod rails are another example of this. They are generally on the lighter end of the market to begin with but the availability of direct connect mounts makes them even lighter than a similar rail without the ability to direct connect mounts. Finally, don’t buy slick sided tube style rail and then mount a bunch of rail sections to it. With proper component selection, you can mount your light, front sight (if necessary), and sling (use an offset sling mount) on the top rail and you can direct connect items like hand stops. You probably don’t need side rails. If you are limited to plastic, non-free float hand guards due to your budget. 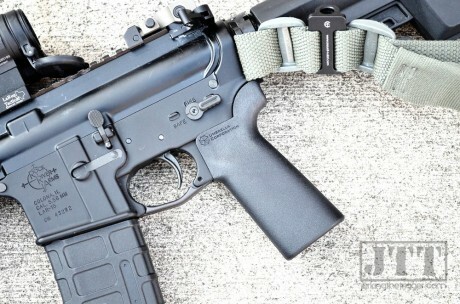 Consider something like the Magpul MOE hand Guards or the even lighter and slimmer B5 Systems KeyMod Hand Guards. You will save weight by using direct connect items like light and sling mounts versus trying to bolt rail sections onto standard hand guards. Some of the lightest free float hand guards are very middle of the road when it comes to price compared to other rails. These include the Midwest Industries SS Gen2, Troy Alpha, Samson Evolution (and derivatives like the even lighter Rainier Arms Evo), Noveske NSR, and Apex GatorGrip. The new ALG Defense EMR is a particularly affordable option. It has built in sling mounts which save weight. Don’t overlook the Fortis REV series. People tend to think of the slick tube style rails when they think lightweight but the Rev Rails are likely the lightest aluminum rails on the market. It also has built in sling mounts. The new BCM KeyMod Rail is the Cadillac here. Its magnesium allow construction makes it strong and obscenely lightweight. 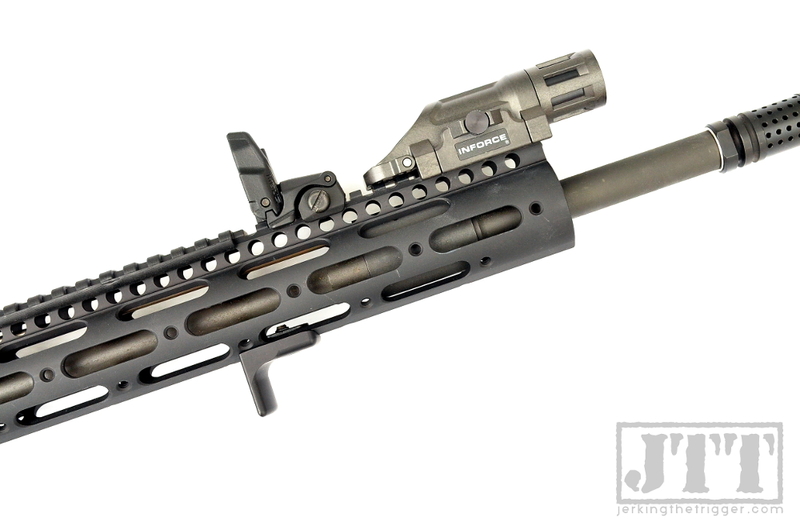 Gas block and front sight considerations go hand in hand with your rail considerations. Standard fixed front sight bases are surprisingly heavy. You can save a considerable amount of weight by switching to a low profile gas block and a separate front sight. A lightweight extended rail over a low profile gas block is lighter than a short rail or hand guards behind a fixed front sight base. A low profile gas block can give you more hand guard options on a 14.5″ build. There are various weight saving small parts available that, when used in concert, can make a real difference in weight. Most of these are going to require some tear down to install though some can be coaxed into place without much disassembly. V7 Weapon Systems manufacturers several of these parts including a lightweight port door and port door hinge pin, lightweight Ti takedown pins, lightweight buffer retainer pin, and a lightweight magazine catch assembly. This section contains gear and strategies for shedding weight that can be completed without tearing down an existing carbine. These are basically all drop-in/bolt-on parts that can save you some serious weight as part of your overall plan. Stocks can vary wildly in weight and because of that, this can be a key place to lose weight. The old CAR style stocks are extremely lightweight but they are also difficult to find these days. 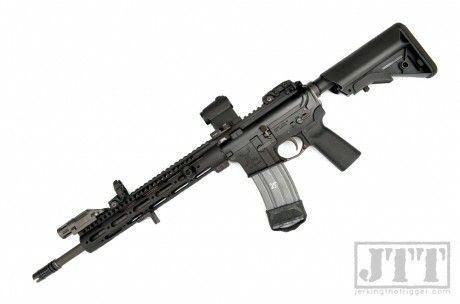 The Mission First Tactical Battlelink Minimalist weighs an astonishingly light 5.8 ounces. It is a GREAT option for those looking to shed ounces. The B5 Systems Bravo SOPMOD and Magpul MOE are also relatively light and manage to pack in more features than most lightweight stocks. You might be surprised at how much some vertical grips weigh. If you can get by without one, that is your best bet. If you can’t, consider a hand stop instead. Hand stops like the direct-connect Weapon Control MOUNT-N-SLOTs from IWC (use code “triggerjerk” to save 5% at IWC) are extremely lightweight, especially compared to most vertical grips. If you already have a vertical grip but want to lose some weight, consider chopping the vert grip to as short a length as you can comfortably use. There are weapon mounted lights that weigh well over a pound and lights that weigh as little as 3 ounces. Your choice here will have a major impact on the overall weight on your carbine. Lights that require an additional mount typically weigh more than those that don’t. The weight conscious should consider lights that have their mounting interface integrated like the INFORCE WML, Surefire X300 Ultra, and ROSCH Works SL1. The INFORCE WML (upgrading to 200 lumens since the linked review was published) weighs a measly 3 ounces and it can be mounted and used comfortably on just about any rail thanks to its unique switch. That is something that can’t be said of most lights. The X300 Ultra is the heaviest of those listed above but it outputs the most light at 500 lumens. If you need a lot of light in a relatively lightweight package it is a good option. Don’t forget to add a Unity Tactical EXO. 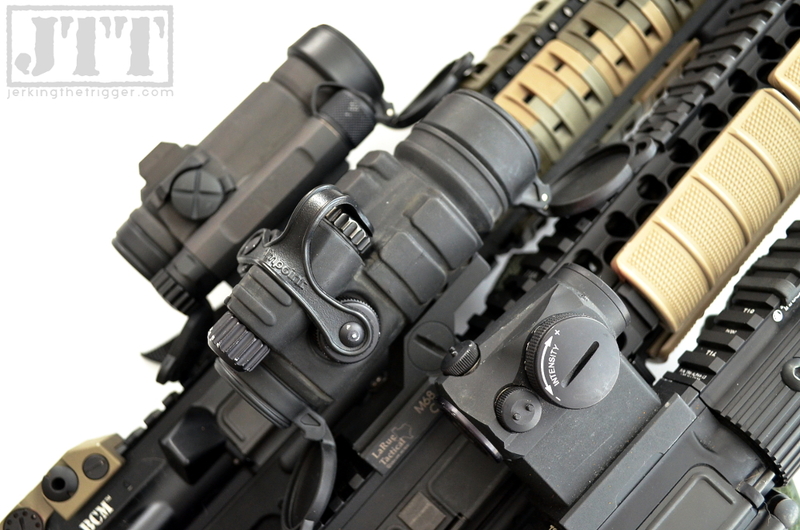 The ROSCH Works SL1 is the holy grail of lightweight weapon mounted light options. It weighs just 3.2 ounces and has a front sight built in! That means you can save the additional weight of having to install a separate front sight. 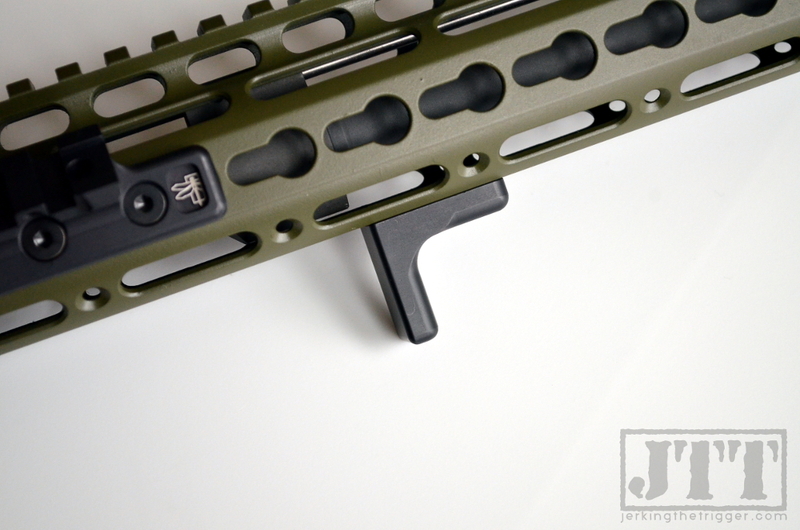 However, the SL1 will only work with an extended hand guard since it is designed to be mounted on the top rail. Slings mounts can vary a little in weight but the main way to lose weight here has more to do with strategy than gear choice (though some gear choices will help). 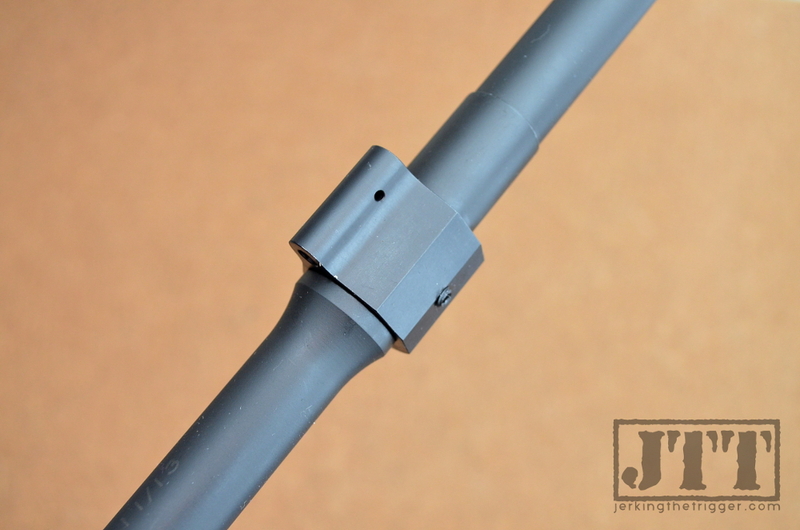 The lightest front sling mount that I can think of is the one that is built into your rail. If your rail doesn’t have built in sling mounts, then obviously you need to explore some options. If you have a Magpul MOE Hand Guard or Troy Alpha rail, the IWC Micro QD Sling Mount is going to be your lightest option. If you have a hand guard that only has a top rail, don’t bolt on a rail section just to add a sling mount. 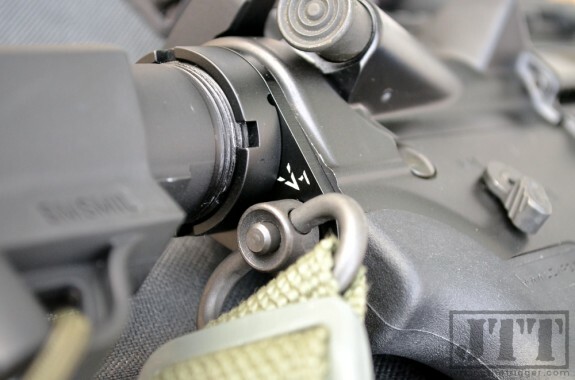 Place an offset sling mount like those from IWC or Fortis on your top rail to keep weight to a minimum. Believe it or not, the rear sling mount that is built into most stocks is not the lightest rear sling mounting option. The V7 Lightweight Castle Nut and Sling Plate will actually reduce the overall weight of your carbine by replacing steel parts and add a rear sling attachment point. Grips are a pretty personal item. I wouldn’t go with a smaller, lighter grip that didn’t fit my hand. The UCWRG Grip 23 is a relatively light option and it fits me perfectly so that is what I use. You should probably find the lightest grip that fits you rather than the lightest overall grip. Optics should be suited to the purpose of the carbine and their quality is part of the overall reliability of the carbine so you should not skimp here in the name of weight. That doesn’t mean you don’t have some lightweight options. A full size Aimpoint in mount is relatively lightweight at around 12 ounces. However, an Aimpoint Micro in a mount typically weighs 6 ounces or less and they are nearly bomb-proof. Aimpoint Micros are an easy choice for the lightweight carbine. If you want a red dot that is even lighter than the Aimpoint Micro, you might consider a Trijicon RMR. Many do not think of the RMR in the role of primary optic but it works well in this role. 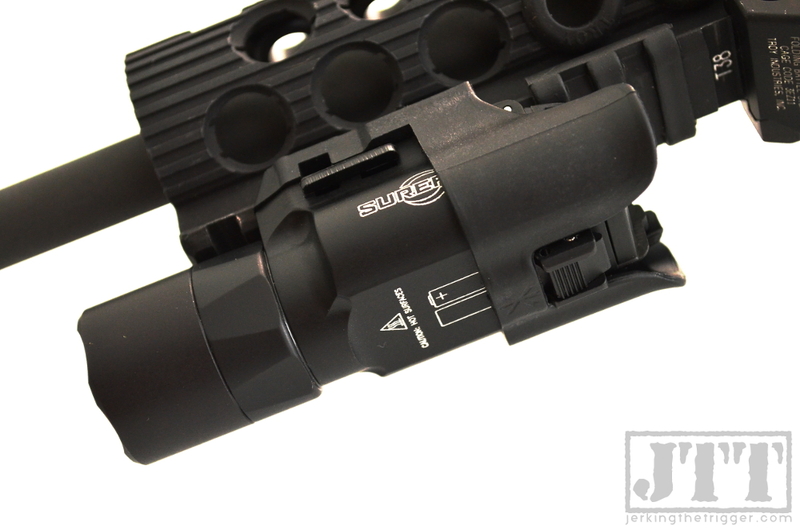 Your mounting options will be more limited versus the Aimpoint but they are extremely lightweight. If you need/want magnification for your application, it is hard to beat the Compact ACOGs for their combination of lightweight and durability. The TA33 in particular is an amazing optic that offers 3X magnification, weighs only about 9 ounces with an upgraded mount, and fits the realistic capabilities of the 5.56 carbine well. I have written about what makes it unique before. You should be able to get your carbine to down around 6 pounds (unloaded, not including a sling) with an optic, light, and extended rail by paying attention to the items above. These are not the only places that you can lose weight. It is really up to you as to how much research you can tolerate in the planning stage. If you want to seek out the lightest possible trigger group, muzzle device, detent pins, and so on that fits your purposes, more power to you. Those details can make an overall impact and might be worth your time. Remember, choose the lightest possible parts that still meet your requirements for reliability, durability, and budget. You should also consider the down stream consequences of the products you choose to your overall weight and budget (ie integrated sling mounts, availability of direct connect items, etc). It sounds simple but it is a quest that will consume you if you let it. PredatorARMAMENT does a great job of stocking many of the newest lightweight rails on the market. If it is lightweight and affordable, they have it. It is hard to beat Brownells for selection and service. I tend to purchase most of my items there because of the trust they have built with me over the years. The newest version of the the Fortis REV Rail is the 9CAR. 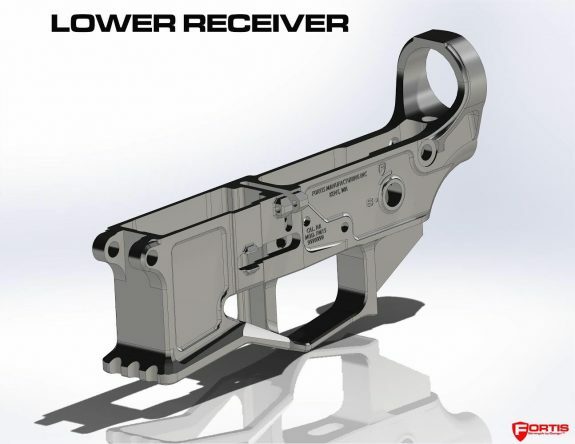 It is designed for AR-15s with the carbine length gas system. This iteration of the REV Rail has all the same features that the REV has become known for including, extreme light weight, KeyMod attachment points on the 3 and 9 o’clock sides, full rails on the 12 and 6 o’clock sides, and forward partial rails at 3 and 9 o’clock. The 9CAR sets itself apart with an front sight base (FSB) cutout that allows it to wrap around the FSB (or piston system) on the sides and bottom which can be an ideal place to mount a weapon light. Check out the new Fortis REV Rail 9CAR. 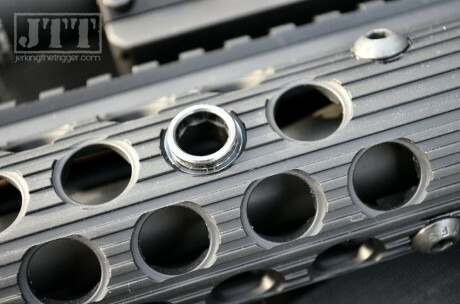 The Fortis Manufacturing REV Free Float Rail System has been making waves thanks to its very light weight, unique one piece design, and mix of KeyMod and 1913 rail compatibility. Fortis initially released the 12″ version, then a 14″ version, and now they have just introduced a 9″ version. 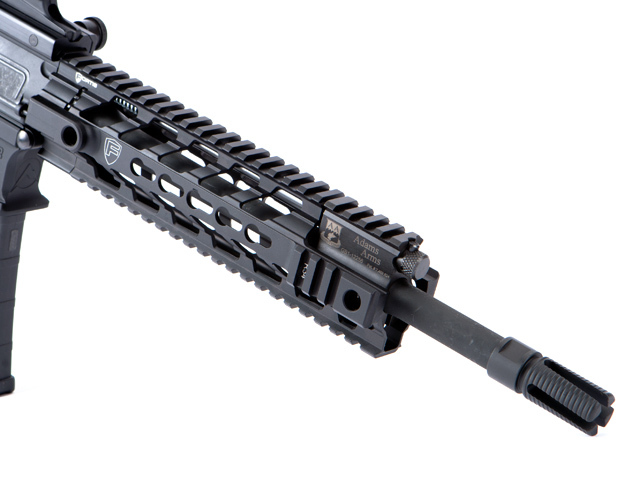 The new 9″ REV Rail weighs an impressive 7.9 ounces! Like the previous versions of the REV Rail, this one is made in the USA from 6061-T6 aluminum that is hard anodized. It has KeyMod attachment points on the central portions of 3 and 9 o’clock rails. The REV Rail also has 1913 rails on the 12 and 6 o’clock rails and the forward portions of the 3 and 9 o’clock rails. 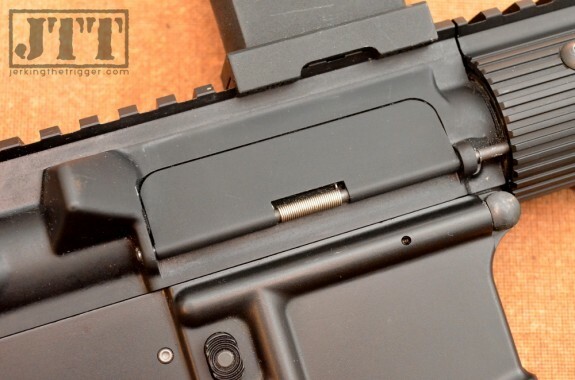 The REV Rail attaches via the standard AR-15 barrel nut and has anti-rotation tabs. Check out the Fortis REV Free Float Rail System – 9.